When the traveler is fortunate, there comes in her path, a pearl of great price. To receive it, she needs to shed – her hesitation to accept, her inhibitions at showing her true self even to herself, her disappointments at the illusions that surround her life. When she has the courage to shed, she is ready to receive. When they meet, and the teaching is imparted, the radiance of the pearl increases. There are many teachings flowing into the world today. 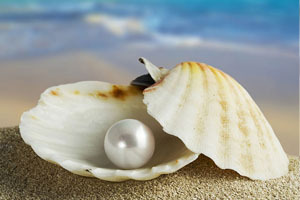 There are teachers imparting teachings that are like the priceless pearl. They are not given brain to brain or body to body, though both body and brain are involved. They are imparted from one consciousness to another. In their giving and receiving, the joy of the world increases for all who are in their radiance. When you are ready, your gaze is fixed, like Prince Arjuna‘s, on the pearl. When you are not ready, you fuss about the oyster. Prepare to receive the priceless pearl. It is in this world today. Do you know what it really is? It is the unfolding of your own consciousness. You are ready to glow. Posted on July 30, 2013 August 3, 2013 by Meenakshi ~ Journey In WholenessPosted in Healing MessageTagged focus, pearl, perspective, student, teacher.